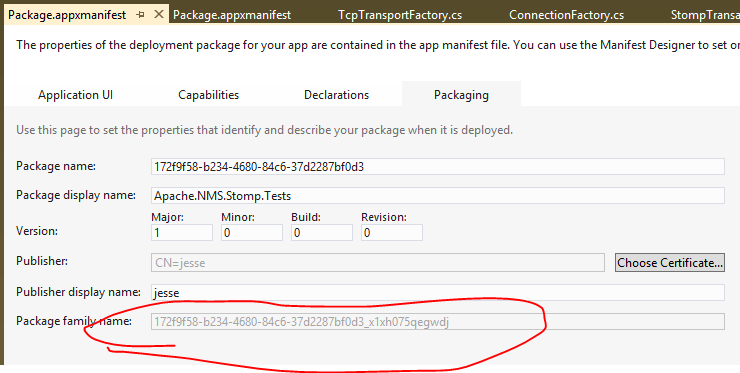 The problem: running unit tests on a Windows Store app that connects to a port on localhost results in the error “A connection attempted failed because the connection party did not properly respond after a period of time …”. Connecting to a loopback address (127.0.0.1 or localhost) is not supported in a Windows Store application. Period. 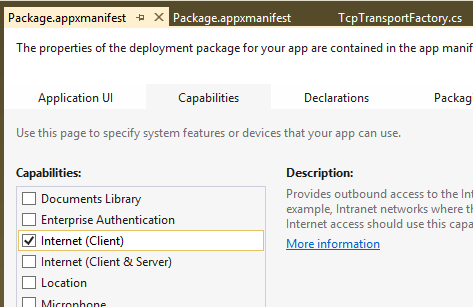 However, connecting to localhost while debugging an application in Visual Studio IS supported. For example, suppose you have an app that connects to a web service to consume data, and to test it, you want to host the web service on your development machine. This does work. How to get it working is a little bit obscure. This should be a familiar step. This capability (and possibly Internet (Client & Server) ) is required for all Windows Store apps that use the internet, even outside of development. More details here. You can read more about the checknetisolation tool here. Now you should be able to use StreamSocket to connect to localhost – but only when debugging. No Replies to "Windows Store apps: StreamSocket connection to localhost"
IE 11 can’t connect to localhost?